A film shot on location in southern and western Scotland and based on a true story from the Outer Hebrides is hitting the big screen. 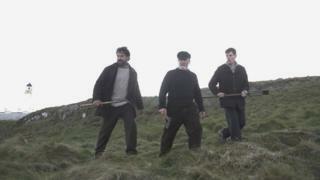 The Vanishing - previously entitled Keepers - stars Gerard Butler, Peter Mullan and Connor Swindells. It was filmed at a number of spots in Dumfries and Galloway and on the Firth of Clyde in 2017. It is based on the true story of the disappearance of three lighthouse keepers on the Flannan Isles. Three lighthouses in Dumfries and Galloway - Killantringan, Mull of Galloway and Corsewall - along with Cloch in the Firth of Clyde - were used for filming. They also filmed in Port Logan, which was said to have many similar features to the Isle of Lewis harbour where the men would have sailed to the Flannan Isles. "We had lots of offers to take the film elsewhere but we always held firm to the idea that we wanted it to be shot in Scotland," said producer Sean Marley. Paisley-born Butler took to social media during filming to say how much he was enjoying being back in his homeland. "I have not made a movie in Scotland since Dear Frankie in 2001," he added in the film's production notes. "I've been reminded of how proud I am to be Scottish while making this movie." The film was directed by Kristoffer Nyholm, best known for The Killing. It has already been released in the United States and is now being released in the UK. It was the social media sensation of spring 2017 in southern Scotland. You could hardly scroll through Facebook or Twitter without some picture of Hollywood action hero Gerard Butler meeting the locals popping up on your timeline. There was a real buzz about the western end of Dumfries and Galloway as the cameras rolled on what was then called Keepers. It is now out on UK release as The Vanishing, with the region getting its moment in the spotlight. It will be hoping to bring back more big productions in future - and enjoy the tourism spin-offs that a major movie can bring.